BLUE/PURPLE ARGENTA by Kage - extremely rare! Please refer to our stock # ARGENTA4 when inquiring. A super rarity indeed. 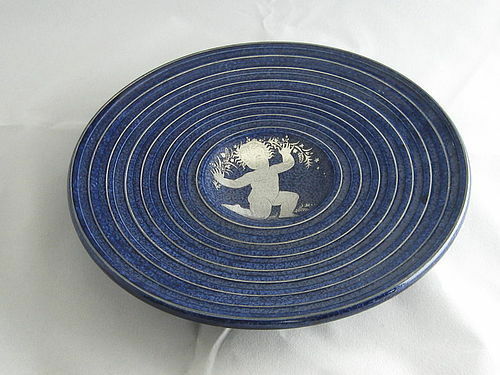 This early Argenta platter (8 13/16" in diameter and 1 1/2" high) has a royal blue mottled glaze that Kage did very infrequently. On the underside of the foot is painted in silver Hand Drejad, Argenta, the model number 1052 I, Gustavsberg, the old anchor insignia, Kage, and the letter G. In the center of the platter, surrounded by cocentric lines in silver, is a male putti surrounded by a garland of flowers. This piece was made in 1938 and is in mint condition. An unusual and truly rare artwork for the advanced argenta collector.